Flyboarding Toronto is your ultimate hydro-flight destination! Flying over the water is an experience like no other. Our creative instructional techniques are paired with cutting edge flyboards, the best available on the market. Jet board rentals include a training session with a knowledgeable instructor, helping you get started with flyboarding the fun and easy way! Beautiful Lake Simcoe is our base for flyboarding, just an hour’s drive from Toronto. This location is the most ideal setting for the sport as the waters are calm, clean and safe for all water sports. That being said, we are also mobile and are able to accommodate large parties! Let us bring flyboarding to you at your water front residence anywhere within a few hours from Toronto. Experience an invigorating adrenaline rush from flyboarding. Great for any adrenaline junkies out there, this sport creates adrenaline from the sudden demand for energy needed to balance on the flyboard. The cool lake water gets your immune system going, improving it through stimulating the increase of white blood cells. An increase in white blood cells is beneficial in resisting diseases and infections. Besides improving your balancing skills, flyboarding strengthens your leg and core muscles. Balance requires the use of abdominal muscles which act to distribute body weight better. Every muscle in your body is activated during flyboarding. Without doing too much calories are burned, the amount varying based on your weight, age and the time you spend flyboarding. Sunshine helps the body absorb phosphorous and calcium. This improves the immune system while also minimizing acne, boosting skin elasticity and stimulating the production of collagen. Unwind in a natural setting. A relaxing beach atmosphere and engaging physical activity will do wonders for relieving stress while letting your mind be at ease. The most spectacular water sport of the past decade! Among extreme sports Flyboarding is the youngest. After building many prototypes, Franky Zapata (a French water craft rider) perfected his design in 2012, which are the flyboards we use today. The design allows flyboards to be stable in the air while descending and ascending, also allowing for tricks. Underfoot jet propulsion and hand stabilization are used to achieve this. 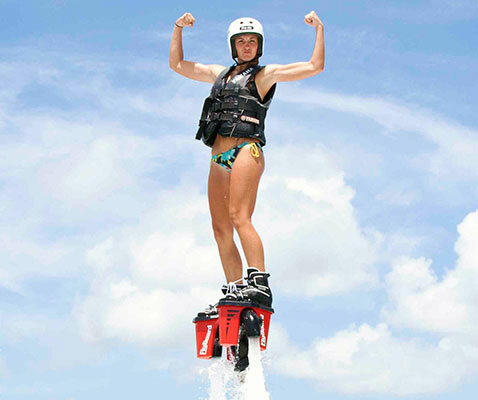 Now, flyboarding is hitting beaches across the globe as a rapidly expanding and incredibly interesting sport. Toronto now has its own flyboarding scene. Be among the first to try this captivating and thrilling new sport! Enjoy an amazing water flying experience that allows you to stand over the water and do awesome tricks!